A.k.a. tortillas, these are flatbreads with fat. Choose the fat: butter, vegetable shortening, coconut oil, or lard. These, alone or in any combination will bring a flaky texture to the flatbread and a more complex flavor that is irresistible. At the Roan Mills test kitchen we often use lard and prefer to render our own from humanely raised pigs. Combine the flour, salt and the lard and mix until the fat has melded with the flour to create a mealy texture. Begin to mix in the water and once the dough begins to hold together begin to knead it gently until the dough is smooth and elastic. Cover the dough with a damp kitchen towel and allow it to rest for 10 minutes. Meanwhile, heat a 10' cast iron skillet or griddle over high heat. Divide the dough into 12 equal pieces and round these using a gentle touch and cover them with the damp towel. When the skillet/griddle is hot, place a ball of dough on a floured work surface and press it flat. Using a rolling pin begin to flatten the dough with light pressure and working clockwise, roll the dough into a 6" disc. Lift the flatbread from one edge and allow it to drape across your hand. Transfer the flatbread in a swift motion onto the hot surface of the skillet. Bubbles will appear and it may puff, flip it over after 30 seconds and cook the other side for 30 seconds. As the heat builds the cooking will go faster and the heat may need to be adjusted down. Pile the cooked flatbreads onto a towel-draped plate to keep them warm. Serve alongside any savory stews, grilled meats, vegetables or use as a wrapper for portable meals. 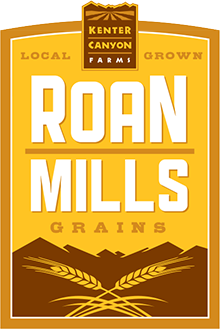 In the Roan Mills test kitchen we wrap up spicy scrambled eggs before heading out to farmers markets in the wee hours of the morning. These flatbreads can be reheated after they've cooled but they are at their best hot from the griddle.